We thoroughly enjoy the presence of children at Heritage Family Church, and when you visit you will notice that we include the children in everything we do. Most noticably, we involve our children in the worship service rather than providing separate Sunday School classes. We believe that it is vitally important for families to worship together. There is nothing quite as sweet as worshipping side by side with your children, grandchildren and great-grandchildren. The best way for children to learn how to approach the throneroom of God is to see it being modeled by their parents. They will not learn this reverence on their own or from other children their same age. When you bring your children to Heritage Family Church you will have the opportunity to teach them how to worship God and serve the body. We are available to help you do this. We understand the challenges that come with having your children in the worship service with you, especially if you have not yet begun to take the responsibility of spiritual leadership in your home; and let’s face it, most of us were never taught how to do this. We understand that toddlers wiggle and babies cry but we are always working hard to teach them to sit still which shows the children that we honor the worship of God and respect the people around us. We also encourage parents to keep the children seated during the service since wandering around and going in and out is distracting to those around them. It is wonderful, life long lessons for our young ones to learn to control themselves and to respect others. If your child isn’t being quiet, we do encourage you to take them out of the service and out of ear shot to correct them, only returning once the child has become quiet. If you have not yet worked on this with your children, we’ve found the best way for them to learn is to practice at home. Then when Sunday worship comes along, it’s not so stressful for you parents. There are many excellent training materials available to help you get started in training your children and in leading family worship in your homes. As a church, we are dedicated to building a formidable church library for this very purpose. These resources are available for you upon request through our online library checkout system, or on Sunday mornings at our book table. We will be happy to offer suggestions if you have a specific need. 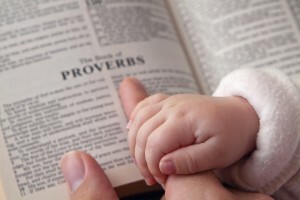 The last words of the Old Testament (Malachi 4:6) are the same words that open the New Testament (Luke 1:17): “And he will restore the hearts of the fathers to their children, and the hearts of the children to their fathers…” The challenges of parenting are not new, and neither is God’s plan for families. We will encourage you in obeying God’s instruction to parents when he gave the Ten Commandments: “And these words which I am commanding you today shall be on your heart, and you shall teach them diligently to your children” (Deuteronomy 6:6-7). As you worship together with your children, remember the words of Isaiah: “All your children shall be taught by the LORD, and great shall be the peace of your children” (Isaiah 54:13).